System faults in industrial environments can be both costly and disruptive, especially if the entire production line is shut down. To anticipate and prevent faults, non-invasive predictive maintenance surveys can be carried out with thermal imaging cameras, using them to reveal abnormal heat signatures that indicate an impending system failure. Manufacturers are then able to address any issues before they develop further and require expensive repairs, ultimately saving money in both maintenance and system downtime. Higher sensitivity thermal cameras mean these surveys can be carried out with greater precision, allowing users to pinpoint exactly what temperature their system starts developing a fault. Equipment such as electrical switching cabinets, pumps, motors and bearings can be checked using thermal imaging, as abnormal temperature spikes can be caused by electrical and mechanical faults. Predictive maintenance surveys also play a role in optimising industrial equipment, according to Jean-Pierre Luevano, international sales manager at Teledyne Dalsa, as engineers can use it to determine the best operating parameters for their systems, so that maximum productivity can be achieved at safe operating temperatures. These surveys can be carried out using either fixed thermal cameras that enable round-the-clock monitoring, or handheld systems that allow engineers to walk the factory floor, examining a range of different equipment. In both cases users are first advised to perform a baseline survey after purchasing a camera in order to determine the regular operating temperatures of each of their machines, the results of which are saved to the camera and can be used for comparisons in future surveys to determine any fluctuations in temperature. 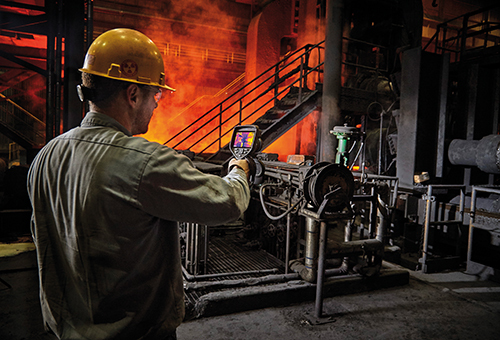 Flir recently introduced a range of three handheld point-and-shoot cameras that have applications in predictive maintenance, the E75, E85 and E95. Each is equipped with laser-assisted autofocus and offers thermal sensitivities less than 0.03°C to give accurate readings. The systems also feature a screen crosshair function so that users can target specific regions in a field of view and obtain precise temperature readings from the subject. The Flir E85 and E95 models include a three-in-live mode, enabling three separate crosshairs to be positioned on the camera’s screen to measure three different areas of a target individually (a three-phase supply, for example). This reduces the amount of work that would otherwise have to be done post-process when examining collected images. 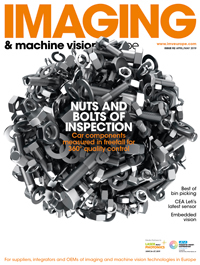 According to Baker, the industry norm for performing predictive maintenance is to use a 320 x 240 pixel detector – the same resolution as the Flir E75. The E85 model offers an improved 384 x 288 pixels and the E95 a further increase to 464 x 348 pixels. Unlike optical imaging, thermal sensors are not widely offered at megapixel resolutions, and are instead mostly used at QVGA and VGA resolutions. In situations where users do wish for higher quality images however, for example to observe temperature changes across tiny components, sensors such as thermal chip manufacturer Ulis’s Pico 1024 are available, offering 1,024 x 768 pixel resolution and operation speeds of up to 120fps, along with the ability to detect temperature changes as low as 50mK. Having this level of precision could help detect fatal temperature increases as soon as they occur in a system, enabling it to be shut down before any further problems develop. In addition to crosshairs, thermal cameras often also include a box function on the screen that reveals the maximum temperature within a certain area. With either feature, users are able to set a threshold temperature value that corresponds to when their system is developing a fault. Any temperatures above this threshold will then be clearly revealed on the camera’s screen to the user, allowing them to deal with the issue immediately. In the case of Flir’s cameras, the isotherm feature can be used to alter the display so that only temperatures exceeding the threshold values are shown. ‘For example, if a manufacturer doesn’t expect to see any temperatures above 60°C when examining a piece of equipment, then the camera can be set to only reveal temperatures that exceed that critical value, indicating a potential fault whenever any colour is shown,’ Baker explained. Fixed thermal cameras, while not being able to offer the flexibility of handheld systems, instead enable users to carry out automatic, round-the-clock predictive maintenance inspections. By linking these systems with an alarm that triggers whenever they rise above a certain threshold temperature, the user can create an automated early warning system. For fixed surveys Flir recently introduced its AX8, which can be used to monitor equipment such as critical bearings, motors and electrical switch gears. Baker remarked that while fixed thermal imaging is still in its infancy, Flir does expect the format to see good growth over the coming years. Teledyne Dalsa offers its Calibir VGA (640 x 480-pixel) camera for fixed thermal inspections, offering thermal sensitivities less than 70mK and frame rates between 30 and 50fps. The small 29mm3 camera body enables the system to monitor equipment inside tight spaces, broadening the range of environments it can be used in. Fixed systems such as the Calibir can be used to monitor up to 10 different regions of interest within the same field of view, allowing them to capture information on several different machines or motors simultaneously. Different threshold temperatures can then be set for each area that trigger alarms or shut down equipment when exceeded. Later this year Teledyne Dalsa intends to release a second, lower-cost fixed system with a lower resolution. Introducing less expensive alternatives helps broaden the uptake of thermal imaging by those who would previously struggle to invest in the technology. According to Baker, Flir is continuously looking to get more users involved in thermography, as many are not yet aware of its capabilities and are now able to afford the previously unattainable cameras thanks to the lowering costs of thermal equipment. ‘This is what Flir has really been concentrating on, making these products available to the masses,’ he said. ‘Twenty years ago I kept hearing: “I’d love to buy a thermal camera, but I can’t afford it.” Now anyone can afford one.’ Thermal cameras have now become available for not only small- and medium-sized enterprises, but also household electricians and plumbers who find applications for them on a daily basis. Baker explained that once customers obtain an introductory camera and receive the appropriate training, they often realise the full extent of what thermography can do and eventually move on to more advanced systems. To ease this upgrading process, Flir has equipped each of its systems with the same graphical user interface, meaning users of entry-level cameras can expect the same experience when progressing to more sophisticated systems, without having to undergo further training. The decreasing price of thermography will also increase the uptake of embedded systems, according to Teledyne Dalsa’s Luevano, who believes that in 10 to 15 years thermal detectors will be integrated into many more everyday scenarios: ‘High-end cars are already featuring thermal cameras to detect objects in the road ahead, whereas lower end cars do not feature them at this time, as to do so would increase their price significantly. In the semiconductor industry it is vital that the silicon be checked for a range of defects at each point in its production cycle. For this application shortwave infrared (SWIR) 2D and line scan InGaAs cameras can be used to inspect silicon bricks, ingots, and wafers before they are processed into delicate components. Impurities and inclusions inside silicon bricks or ingots can be detected using a SWIR camera and a light source emitting above 1,150nm. While the bandgap of the silicon absorbs photons in the visible band, lower energy SWIR photons are not absorbed, and can therefore reveal impurities that, if left unchecked, could cause damage to the production equipment when the bricks and ingots are sliced into wafers. For this process, infrared specialist Xenics offers cameras such as the Bobcat 640 and the Xeva 640, in addition to its high-resolution Lynx 2048 line scan camera. Furthermore, once the bricks and ingots are processed into wafers, further defects such as particles or cracks can exist inside or between the thin slices. While visible CCD or CMOS cameras could be used to detect defects on the surface of the wafers, SWIR cameras again have the capability to see inside them to reveal imperfections. In addition to the two 640 models, Xenics also offers its Xeva 320 and Bobcat 320 models for wafer inspection. This ability to detect cracks also extends to silicon wafers for solar panels, where defects can lead to the breakage of individual solar cells. Xenics’ Lynx 2048 camera has further application here, along with the Lynx 1024, both which can be used to perform a relatively new crack detection technique that uses transflection illumination, an optical phenomenon that combines the elements of reflection and transmission. Light enters the silicon wafer, scatters, and then exits from a different position, revealing small cracks or micro-cracks by causing them to cast a shadow signature much larger than the crack itself, making them easier to detect.